Cocoa powder, or unsweetened cocoa is made by milling cocoa cake into powder form. Cocoa cake is the remains of chocolate liquor after most of the cocoa butter is removed. Since most of the fat has been extracted, cocoa powder is considered the least fatty form of chocolate. The powder possesses a strong to mild chocolate flavor without the texture characteristic of cocoa butter. Natural powder color ranges from light tan to brown. Some of the powders uses are evident in reduced fat and calorie recipes, chocolate milk, ice cream, chocolate flavored coatings, biscuits, syrups, and tobacco products. Cocoa powder has a natural acidity, and when it is treated with an alkali to neutralize this acidity, it is called Dutch process cocoa (also known as Alkalized Cocoa). The alkalization process was developed in 1828 in the Netherlands. 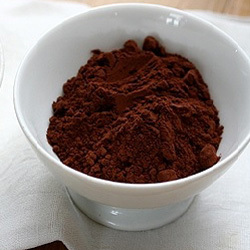 Alkalized cocoa powder color ranges from dark brown to black. The alkalization process enhances pH levels to as high as 8. 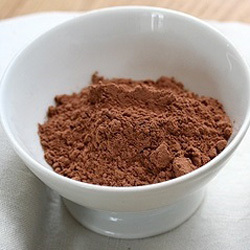 Its uses are similar to natural cocoa powder as it is also used in chocolate milk, ice cream, chocolate flavored coatings, biscuits, syrups, and tobacco products. However, its deeper color provides a richer visual appearance and its less acidic flavor blends well with other ingredients.